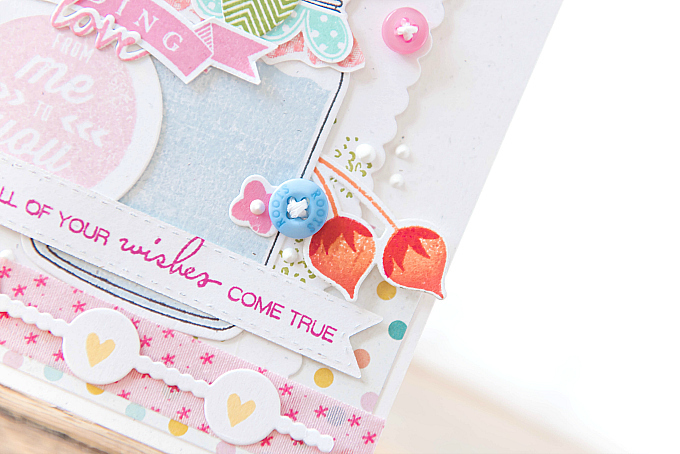 It's a special day over on the PTI blog, with a brand new challenge, and a gorgeous inspiration photo! 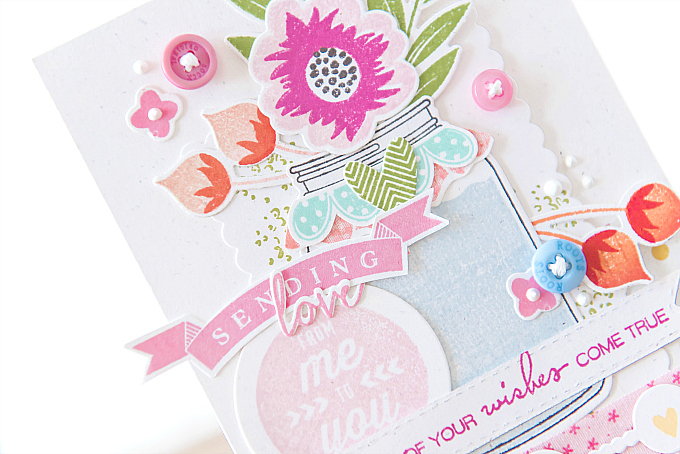 So today I'm sharing a colorful card inspired by the beautiful florals and homey touches. I really wanted to recreate and emulate the beautiful tones in the inspiration image, but also play up the homeyness vibes, too. I decided on a colorful floral bundle tucked inside a mason jar. To start this card, I used PTI's Gran's Garden dies and stamps for all the florals, and stamped them in colors of Pale Peony, Terracotta Tile, Melon Berry, Lovely Lady, Raspberry Fizz, New Leaf, Aqua Mist, Hawaiian Shores and Smokey Shadow. Around the florals, I added a few little liquid pearls, stitched Autumn Rose buttons, and few little flowers. 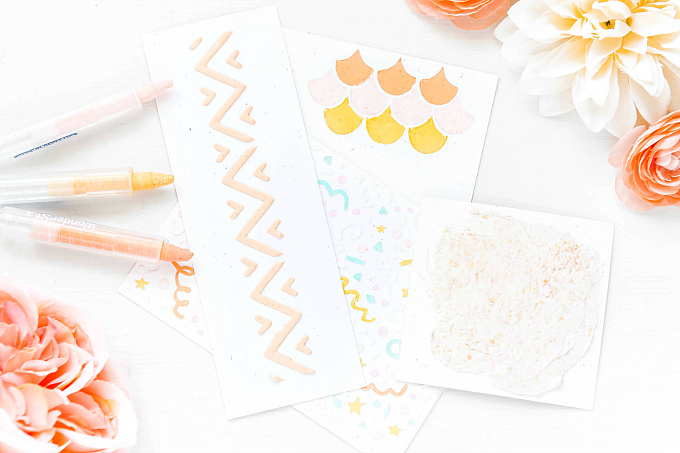 For the sentiment, I used a combination of stamps and soft pink ink colors because I really wanted the look to be "patched together" and extra cozy and homey, just like the inspiration photo. 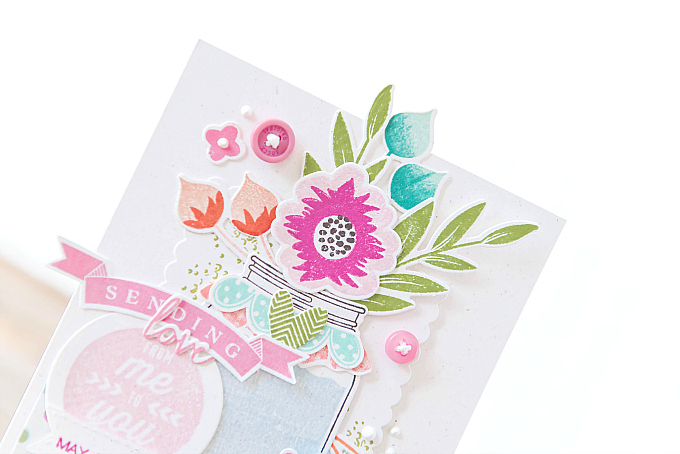 For the sentiment, I used the Hugs stamp set and stamped the banner in Hibiscus Burst. I also used the Swoosh stamp and dies along with Lovely Lady ink, an older circular sentiment stamped in Sweet Blush, and for the final bit, I stamped a sentiment from the Just Desserts mini stamp set in Raspberry Fizz. I added a bit of polka dotted paper (a gift from my dear friend), some patterned fabric tape, and sweet hearts stamped in Bright Buttercup, onto a Confetti Garland diecut. And of course, a dash of few more pearls and stitched buttons! To cut all the goodies I used the new SB.com exclusive Spellbinders Platinum cutting system which is being featured over on SB.com as a bundle!! It's such a fabulous price - I recently picked one up so I could have a second cutting system for crafting on-the-go and I have to say I love it. Bonus, it's white and uber gorgeous! Since it's getting quite late here, I'm saving my hopping experience for the morning - best enjoyed with a cuppa! Beautiful card! Love all the layers and details! Layers of loveliness! How fun is this card! So many wonderful details all working together in a divine mix. Love it all! This is incredible! I love everything about it. 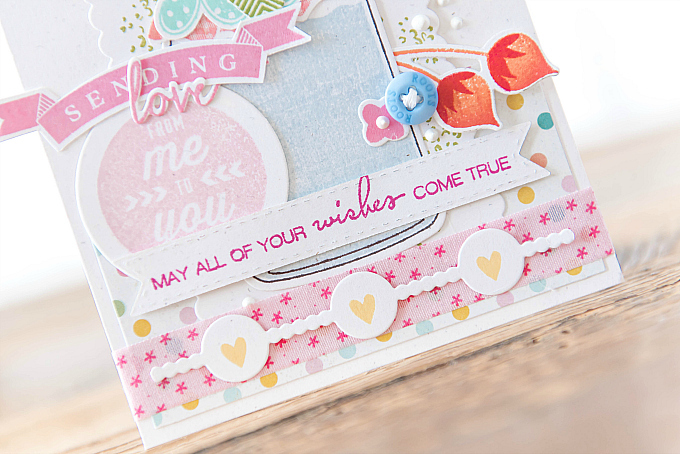 The layering, colors and your choice of stamps is amazing. So much to look at, so beautiful! Thank you so much, Sharyn! I appreciate your sweet note so much! Such a gorgeous card! Love all the flowers and layers. Beautiful job!! You are welcome and I have printed out a picture of this card so that I can make one like it!! Aw, I'm so touched! Please let me know if you have any questions at all! Wishing you lots of fun and sending many hugs! What a really lovely card! 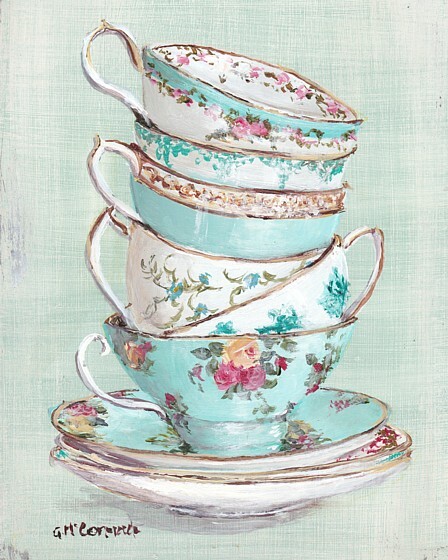 This is layered in prettiness!! Hi Ivana! Sending hugs furst, now on the the comment. You know I love the dainty details and gorgeous textures you use to create you unique and dreamy style. I'm always amazed that you can use lots of product without it ever seeming "too much", you manage to always create a feeling of light airiness sweet femininity. You've don't it again. This card is GORGEOUS, my friend! Aw Cindy! Thank you so much for such a sweet, heartfelt note! :) Sending you the biggest hugs!! Gorgeous!! Love what you’ve created here. The colors are beautiful and yes. Homey. Love it! Thank you so much, Lisa! Sending hugs! I just love how bright and cheerful this card is. The details are amazing - the buttons and pearls - and just lots of layers!!! Bravo! Ivana, what a stunning card! The colors are so pretty and I like how the flowers and banner hang over the edges. 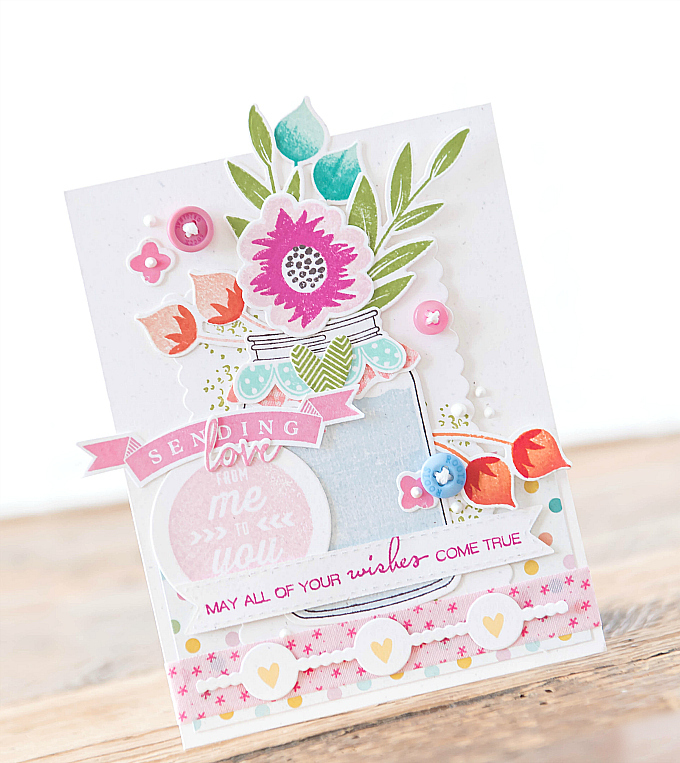 What beautiful layering of all the wonderful die cuts you used! Love the pastel colors, the buttons and pearls! Thank you so much for the sweet and wonderful note, Julia! Sending hugs! Marcia, thank you so, so much for your sweet note! It makes my heart smile that you liked the mason jar :) Sending hugs! Such a pretty card. I really love how you used those mason jars. I just love all the elements you combined and your attention to details! Lovely card! Such a heartwarming and sweet card Ivana! Love the colors and amazing attention to detail! Aw, thank you so much, Samra!! Sending you big hugs! WOW - this is just stunning! Love all your wonderful details, and everything just ties together beautifully! Thank you, Betty! I appreciate your kind words so much! Oh I cannot wait to see your beautiful mason jar creations! Thank you so much for the sweet notes :) Sending big hugs! !